An ancient multi-trunked specimen at Kofukuji, a temple in Nagasaki, Japan. The oldest specimens in Japan are found near temples and shrines. Some of these can be of immense size with stems up to 5 meters long and multi-headed. Usually such long stems cannot stand erect on their own, so they will grow essentially horizontal without support. 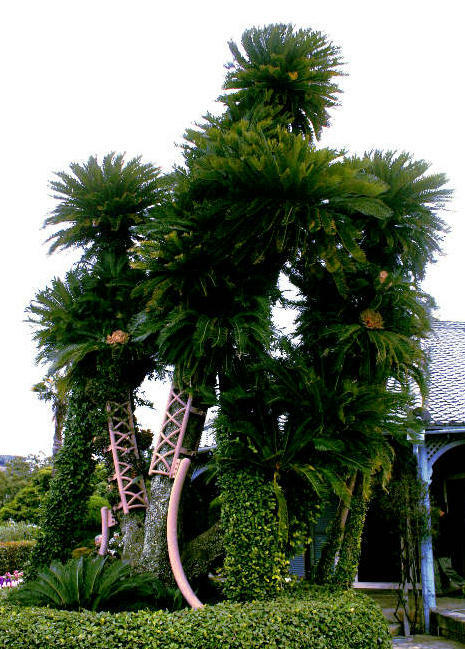 One ancient multi-stemmed specimen exists at the Glover Garden residence in Nagasaki that stands at least 9 meters tall (around 30 feet). It is held up with steel supports, taking away its beauty to some degree. Indeed, many of the truly old C. revoluta in Japan are not the loveliest to look at, but you cannot help but marvel at their age and size. There also exist a number of unusual varieties that have atypical leaf forms that have a distorted look much like the various crested forms of ferns. Probably the best known are ones that have golden leaves or are variegated. One of the more common of these is C. revoluta v. aurea. It flushes with yellow tipped fronds, but in time these become more golden orange and eventually they brown off. This type is commonly available in Japan and can also be found on the world market. Much less common is the pure yellow flushing form, v. alba, known as kogane sotetsu in Japanese (literally meaning “golden cycad”). The rare golden cycad, C. revoluta v. alba. This leaf color fades to light green over several months. The starkly yellow to whitish fronds eventually turn light green within a few months, hence allowing the plant to photosynthesize and survive. This type is very uncommon in Japan, and commands high prices even as a seedling plant. Adults fetch into the thousands of dollars. Finally, a third yellow leaf form exists that is the most sought after of them all, v. variegata. 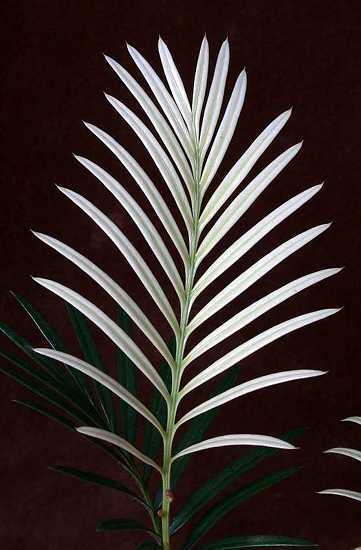 In this form the fronds are a blend of yellow and green with no definite pattern. To many western eyes these plants might even appear to be sick due to the irregular patterning, but to the Japanese they are shear beauty. If you want one you’ll have to truly drain your pocket book though! If all of this weren’t enough, these plants can be grown as bonsai as well. The trick to dwarfing them is much like the way you would take a woody plant and make a bonsai – restrict the roots and don’t over feed them. Since cycads cannot be pruned like a typical woody plant, it is necessary to limit root growth by keeping them in undersized pots if you want to dwarf them. One problem is that this process can take many years since cycads are not what you’d call fast growing, not even C. revoluta. Fertilizer is applied only enough to keep them healthy, but not enough to let them get big. 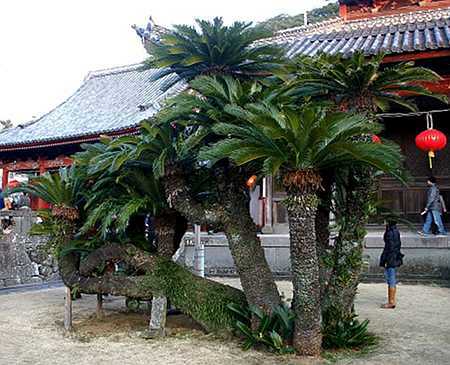 In Japan this is a common technique to keep any plant small, for example palms. The result is quite interesting. Given that this species tends to form pups along its stem, plants often end up with bizarre branching, but stand no more than a meter or less tall. Again, not for everyone, but another way Japanese growers keep this species. 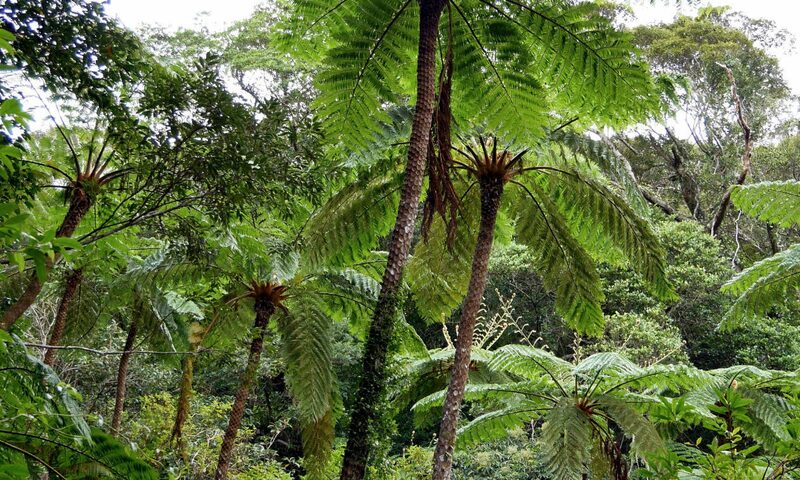 This incredible Cycas revoluta forest is said to number 60,000 individuals. Amami Oshima, Tatsugo Town, Kagoshima, Japan. The only negative thing about this species is that it, like other cycads, is poisonous if eaten. All parts of the plant contain the glycoside, cycasin. If eaten it will lead to gastrointestinal distress and liver failure. There have been cases during famine when people have turned to this species as a food and suffered horribly and the phrase sotetsu jigoku, “cycad hell”, was born. Nevertheless, this species has been used as a starch source on Amami Oshima for centuries, much like coontie, Zamia floridana, was used by native tribes in Florida. The stems are mashed into a pulp and then fermented, thus slowly removing the toxins. Likewise, seeds have been used this way in Japan’s southern islands to make a “cycad cake” called sotetsu mochi. 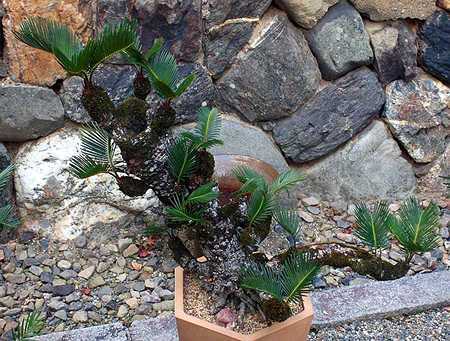 A bonsai C. revoluta at a shrine in Kyoto, Japan. Moreover, crushed seeds are made made into sotetsu miso, a paste much like the normal miso made from beans, in the same area. All of these practices are considered dangerous, but to this day, these traditions persist in local areas. My recommendation is enjoy the plant without sampling a piece! Still, care is needed especially for pets that seem drawn to this plant and likely will die if they eat it. The good news is that it is not a problem for humans. Children don’t find the plant attractive due to its spiny stems and sharp fronds and even the trunk is rough to the touch, so most kids shy away. A hardy plant in the garden with a rich history – any way you look at it, this species deserves attention. Please contact me if you are interested in this article being reprinted in the Cycad Newsletter. I’m looking for Cycad Revoluta Alba. Can you introduce me some seller in Japan that they can supply this plant? Komson, these are available here from time to time – mostly as seedlings or young plants. They carry a hefty price too – minimum of $100 for a two leaf seedling to hundreds of dollars for larger plants. Since this is a CITES protected species, getting them out of country will be a bit of a problem since most Japanese folks have little interest in dealing with foreigners and all the necessary paperwork. I too have little interest in facilitating such transactions given the time and money constraints – simply put, it is not worth my time and effort. I have considered selling seeds one day, but am not set up for that yet. Also, getting viable, true seeds of this plant is a bit difficult. There isn’t much in supply. The best time to buy them is in late winter/early spring when they ripen. Hello, I see seeds for these for sale here in Japan on a regular basis, though I can’t say if they will come true. It is up to the seller – do they send you seeds from real v. aurea plants or just normal C. revoluta? A crap shoot. Normally I don’t allow folks to do trade directly off my blog, but since this is a genuine request, I’ll allow it. If you have any information about seed sources, post a response here and I’ll forward the information. I visited the Devil’s Washboard in Kyushu about 10 years ago and walked through a forest of cycads talker than a man. Ion the very same beach if the Washboard, I bought a single leaved cycad planted in a volcanic rock. I “smuggled” this back home to Singapore. That was my first cycad, and from then on I was hooked. I grew that seedling for 10 years, and sadly I recently lost it to theft. I was heartbroken. My collection now only contains cultivars from Jeju Island, probably also C Revoluta but I miss my Japanese one. If you have any pups of Aurea I would gladly trade an arm or leg for it. Sorry to hear of your stolen cycad – unfortunately an all too common problem with these plants. Another problem you also mentioned is they are addictive! Question, the area you visited was Aoshima in Miyazaki Prefecture? I wasn’t aware of naturally growing C. revoluta on that island, but it is famous for its huge forest of fan palms, Livistona chinensis. I hope one day to go to the huge C. revoluta forest on Amami Oshima one day. The photos of it on the net are amazing. About finding v. aurea – see if you can’t source some in Thailand. Growers there seem to have every cycad under the sun. Have fun! Hi, I am actually travelling to Japan in April – Tokyo and Okinawa. Just for a few days in each city, though. Where is the best place to see the unusual forms of Cycas Revoluta. In particular I’d love to see V. alba (kogane sotetsu) with a new flush of golden leaves. Are there any plant markets in Japan like they have in Thailand ? The plant markets are always very interesting. I suspect that most of the golden leaf forms of C. revoluta are in private collections in the southern islands, in particular Amami and Okinawa. So, you definitely are going to the right area, though I’m afraid I cannot point you to a particular place. The Southeastern Botanical Garden just north of Okinawa City (http://www.southeast-botanical.jp/english/#3) looks spectacular, and should be a good starting point. Many of the pictures I’ve seen on the net of golden cycads are from small islands in and around Okinawa, though I’m sure they exist on the main island as well. In the far north of Okinawa island is Kunigami, a township on the edge of a large natural area worth looking at if you can get up there. I’ve heard that golden cycads can be seen in the community there. As for plant markets, you won’t see any like in southeast Asia. Larger local shrines will often have a plant sale in the spring, and these can have some interesting things to see. Also, the JA Agricultural Cooperative (http://www.zenchu-ja.or.jp/eng), a nation wide organization, has periodic plant fairs. I don’t sell any plant products due to legal issues. You can try Rare Palm Seeds: http://www.rarepalmseeds.com/index2.shtml. They sell internationally and have from hobbyist to wholesale pricing. I don’t think they have C. revoluta at the moment however.